Three men arrested by detectives investigating the attempted murder of a policeman in east Belfast have been released without charge. 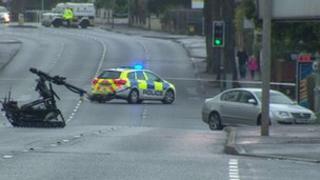 Two men, aged 25 and 34, were detained in Belfast on Sunday - hours after the police officer found a bomb under his car on the Upper Newtownards Road. A third man, aged 41, was arrested in west Belfast on Tuesday. All three were released on Wednesday evening. Police have blamed dissident republican paramilitaries for the bomb attempt. The officer who was targeted found the device during a routine check of his family car at about 14:00 GMT on Sunday, as he prepared to take his wife and two children out to lunch. Army bomb disposal officers carried out controlled explosions and took the defused bomb away for further examination. Police said it was "clearly intended to kill the police officer". A few seconds on his knees to look under his car saved a police officer and his family from carnage on their way to have Sunday lunch. As his wife and two young children watched, he carried out his routine search of his vehicle and spotted a device intended to kill him. "We are very grateful that this officer acted in the way he did and checked his car, otherwise the consequences would have been absolutely devastating for him and his family," says Assistant Chief Constable George Hamilton. Hours after it was discovered, the bomb was defused in a controlled explosion by the army. However the device was recovered partially intact and police hope forensic tests could identify those who made and planted it. ACC Hamilton added that the officer's family and neighbours "were also put at risk of serious harm". He said there was a severe threat level across Northern Ireland and appealed to officers to be vigilant and check under their cars. He hoped the device would be useful as evidence because it was discovered and did not engage. "This murderous type of attack is not the way forward for our society," he added. "No-one is entitled to take the life of another human being in circumstances such as this. Our appeal is for the vast majority of people to stand up against this rump of anti-peace dissident republicanism." A number of houses in the area had to be evacuated on Sunday while Army bomb officers made the device safe. The chairman of Northern Ireland's Police Federation, Terry Spence, said he would be seeking a meeting with Chief Constable Matt Baggott to discuss officers' personal security. In recent years, dissident republican paramilitary groups have carried out a number of attacks on PSNI officers. In April 2011, Constable Ronan Kerr was killed when a booby-trap car bomb exploded under his car in Omagh, County Tyrone. The previous year, Constable Peadar Heffron lost a leg in a similar attack as he drove to work in Randalstown, County Antrim. In November, prison officer David Black, 52, was shot dead in a motorway ambush in County Armagh as he drove to work.